Mike Aoki from Reflective Keynotes and Marty Tracey from LANtelligence are discussing the future of the contact center in the U.S. and Canada. The new generation of customers and Agents are demanding a new way of interaction with the business from inside and outside. Here is a quick recap for you. Reduce employee attrition by reducing AGENT effort. Make it easier for them to do a good job. Leverage technology for better Agent performance. Give them the tools they need to help your customers. Tools can include a better CRM system and knowledge base software. Focus on the AGENT journey (the term comes from CX expert Neal Dlin). Track your Agent’s relationship with your company every step of the way. Does recruitment, hiring, coaching and technology support your Agents? Mike is very active on Twitter and always responds to the messages from the web contact form. Four stages of contact center evolution that show how well your CX is aligned with your customers' expectations. What stage you are at? 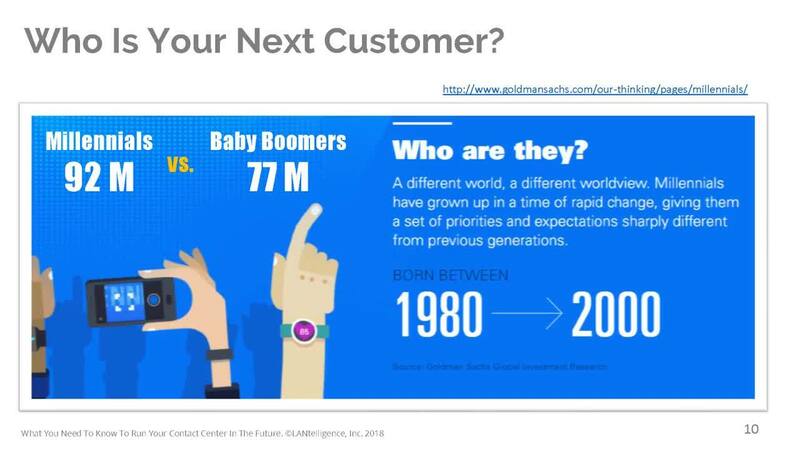 The new generation of customers is already telling you how they want to be engaged and what you do wrong. An optimized contact center pays for itself. This is now a reality that C-level Executives should recognize to be ahead of a curve. You may reach Marty via LinkedIn or this web contact form. The Constellation Research group has examined the reasons why organizations struggle to meet customer expectations. Their report shows how modern communications platforms are vital to winning in the customer experience and tells stories of organizations that put the CX first. Download the white paper to get the recommendations and best practices for evaluating communications platform providers. Contact Center Biggest Challenges and Priorities for 2018, the annual survey by Contact Center Pipeline Magazine, was a starting point for the idea of this webinar.